The struggle continues for the communities in the South Hebron Hills who are an area designated by the military as a firing zone. For years the communities have been living under the threat of expulsion and constant harassment.Last July Israel informed the courts it plans to evict the villagers. The case in currently in court. 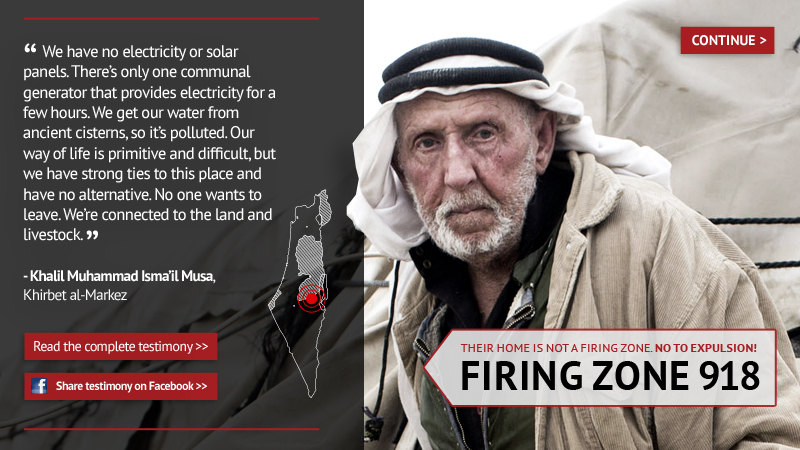 B’Tselem have put together a great resource that outlines the situation here, as well as posting testimonials from villagers in this area. You can find the story here. This entry was posted in Uncategorized and tagged expulsion, firing zone, South Hebron Hills. Bookmark the permalink.